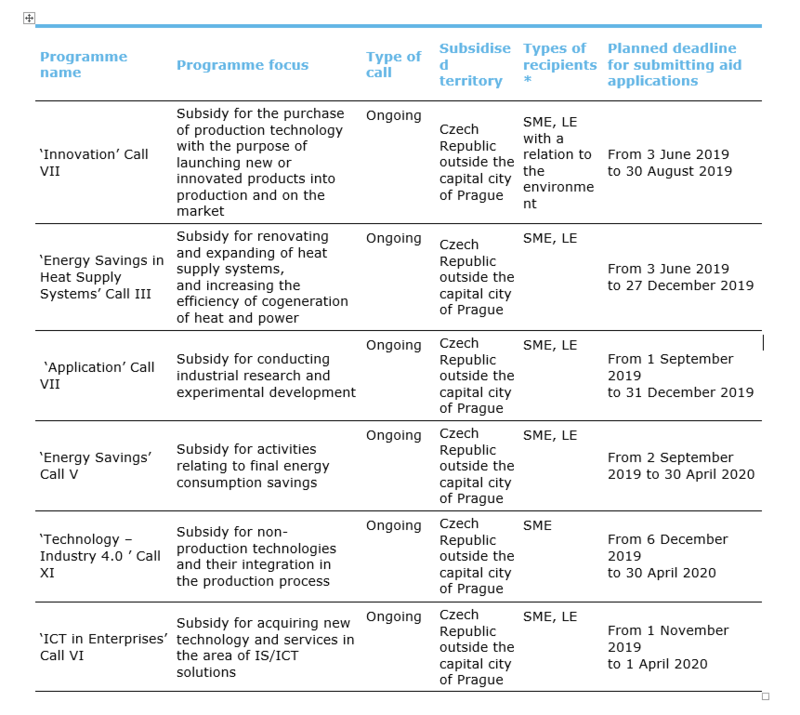 The table below presents the latest schedule of the calls already announced under the Enterprise and Innovations for Competitiveness Operational Programme (“OP PIK”), including the deadlines for submitting applications for subsidy in individual programmes. Concurrently, the schedule of OP PIK Calls for 2019 has been updated. The table below lists a number of anticipated calls, including the deadlines for submitting subsidy applications in individual programmes. Please find below detailed information on selected calls which are currently published. In December, the Ministry of Industry and Trade of the Czech Republic published Call IX within the Technology programme. Eligible applicants include small and medium-sized enterprises. Activities subsidised within the call involve acquisitions of new machinery, technology equipment and integration of those technologies into the production process by means of autonomous two-way communication. The subsidy is not intended for pure renewals of the existing machinery with zero degree of innovation. Subsidies cover tangible and intangible fixed assets. A maximum of 45% of eligible costs for small enterprises. A maximum of 35% of eligible costs for medium-sized enterprises. The amount of subsidy per project ranges between CZK 1 million and CZK 20 million. Subsidy applications may be sent from 11 March 2019 to 13 June 2019. This is an ongoing call. Converting Biogas to Biomethane and injecting it into the network. Eligible applicants include small and medium-sized and large enterprises and except for the “Electromobility” call also publically-owned entities. Innovative activities focused on introducing energy accumulation technologies are supported within this call. The aim relates to, for example, machinery and equipment, underground utilities, engineering activities and construction. A maximum of 60% of eligible costs for large enterprises. Subsidy applications may be sent from 3 December 2018 to 31 May 2019. This is an ongoing call. Supported activities within this call include projects focused on introducing innovative technologies to extract secondary raw materials, introducing innovative technologies to produce products from secondary raw materials, effective extraction of valuable secondary raw materials from used products. The subsidy covers, for example, machinery and equipment, underground utilities, engineering activities and construction. A maximum of 25% of eligible costs for large enterprises. Applications for subsidy may be sent from 3 December 2019 to 31 May 2019. This is an ongoing call. Supported activities within this call include innovative technologies in the area of low-carbon transportation, ie purchasing an electromobile from supported road vehicle categories and acquiring non-public (rapid) charging stations with a possibility of adding an electromobile accumulator. The subsidy covers, for example, acquisitions of vehicles, machinery and equipment, underground utilities and engineering activities. A maximum of 55% of eligible costs for large enterprises. Subsidy application may be sent from 3 December 2019 to 31 May 2019. This is an ongoing call. Activities supported within this call include technologies for converting biogas to biomethane and injecting it into the distribution network or filling it within the local infrastructure. The subsidy covers, for example, construction project documentation, underground utilities, technologies for converting biogas to biomethane, ancillary budget costs and engineering activities under construction. The amount of subsidy ranges from CZK 500,000 to CZK 35 million. The provided support will correspond to the difference between eligible expenses and operating profits from investments. Subsidy applications may be sent from 3 December 2019 to 30 September 2019. This is an ongoing call. In late December, the Ministry of Industry and Trade of the Czech Republic published Call IV within the Marketing programme. Activities supported within this call involve participation in foreign exhibitions and trade fairs aimed at facilitating the company’s access of foreign markets and related services, such as transportation of exhibits, exhibition stand including equipment to and back from the trade fair or exhibition abroad, promotional marketing materials etc. The subsidy may be provided to no more than 10 participations at foreign trade fairs and exhibitions. The level of support per project amounts to no more than 50% of eligible expenses. The amount of subsidy ranges from CZK 200 thousand to CZK 4 million. Subsidy applications may be sent from 1 March 2019 to 31 May 2019. This is an ongoing call. The article is part of dReport – January 2019, Tax news; Grants and investment Incentives. 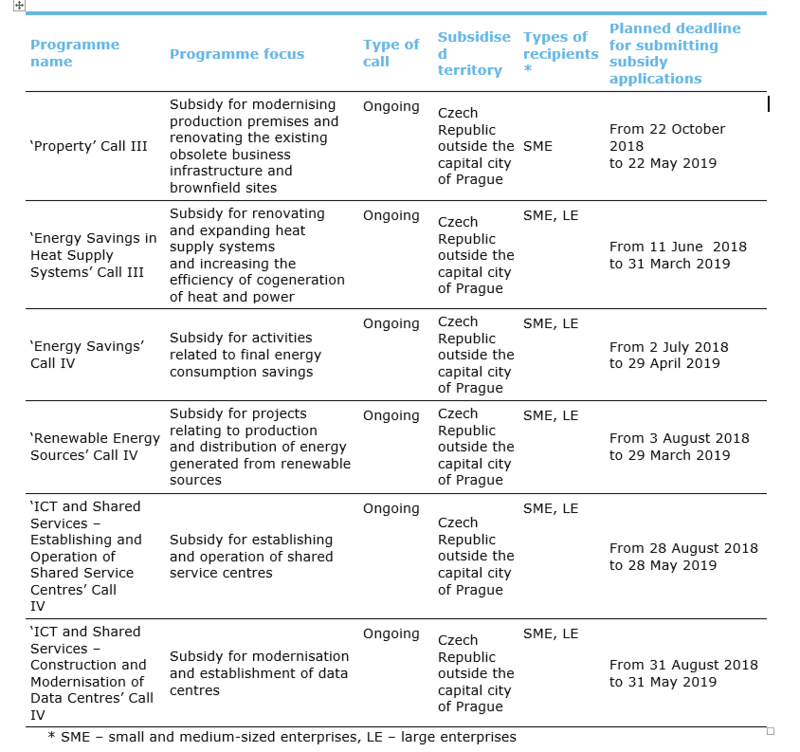 The table below presents the latest schedule of the already announced calls under the Business and Innovations for Competitiveness Operational Programme (“OP PIK”), including the deadlines for submitting grant applications in individual programmes. The Ministry of Industry and Trade of the Czech Republic has decided to simplify the procedure for issuing the Rulings on Subsidy Provision and Ruling Amendments under the Business and Innovations for Competitiveness Operational Programme (“OP PIK”). Subsequent to the change, applicants/recipients no longer have to sign these documents electronically. The Technology Agency of the Czech Republic announced a public call focused on material research. The primary addressees of the call are Czech partners of international syndicates which consist both of research organisations and enterprises. News and trends from key areas we are dedicated to at Deloitte. Click by industry. We are online. Follow us on social media. Do you want to ask us something? Did not find a topic on our blog that interests you? Do you have an idea for improvement?